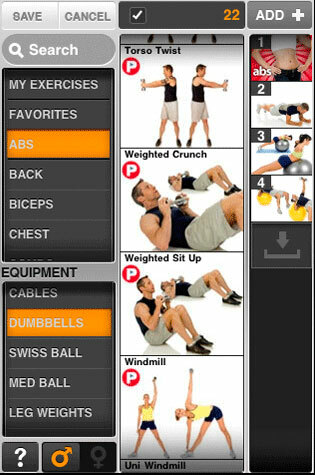 If fitness articles that promise to help you "Lose a Dress Size," "Burn Fat Faster," or provide "Tennis Conditioning," appeal to you, you'll love PumpOne's FitnessBuilder app for iPhone. The basic $9.99 app has 200 workouts which you can sort by location–home, gym, hotel room, no equipment, outside–and goal–heart health, sport conditioning, flexibility, yoga or a specific body part, to name a few. Each workout provides an overview of its benefits, the equipment you'll need and the estimated number of calories you'll burn based on a person who's 120, 140 or 200 pounds. You can then flip through the exercises, which list directions, provide pictures and a video of a person performing the exercise. Or you can build your own workout from about 2,000 exercises. When you're ready to start your workout, you page through each screen following the directions. For time-based exercises there's a handy built-in timer that tracks the exercise time and the rest time. You can log your progress as you go or at the end. For weight-based exercises, you can note the weight you used and the number of repetitions. 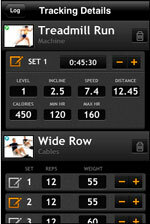 For cardio segments, you can input the level, incline, speed, distance, calories and your heart rate. When you're done, you can store your workout for future reference and save it as a favorite. You can also use the app to track your weight, blood pressure, body measurements and resting heart rate, and there are built-in calculators for basal metabolic rate, body fat percentage and target heart rate. Moving up to the Plus level ($4.99 per month, $19.99 per six months or $34.99 per year) more than doubles the number of workouts and exercises, lets you ask the FitnessBuilder fitness team unlimited questions, and allows you to share your workouts with friends. Yes, it’s available. If you click on the “iTunes” link, it will take you to the iTunes page and launch iTunes to the FitnessBuilder page. Or you can search for “FitnessBuilder” in the iTunes store and it will come up. Sorry you had trouble finding it! Hi! I’ve been looking for a workout builder for a while and I ended up using createworkouts.com because of the number of exercises and the simplicity of the product!Moreover you can either edit from the computer, tablet and smartphone and it is really easy to do! What do you think?